Since 1937, breakthrough ideas have fuelled our work on bringing efficient healthcare solutions to life. This is what we create within our fields of excellence – Anaesthesia, Patient Monitoring & Diagnostics, and Emergency Care. The manifestations of our efforts range from early inventions like the Ambu bag and the legendary Blue Sensor® electrodes to our newest landmark solutions like the aScope™ – the world’s first single-use videoscope. Our commitment to bring new ideas and superior service to our customers has made Ambu one of the most recognized medical companies in the world. Ambu's products are sold worldwide. Exports account for 98% of sales, and sales are handled via Ambu's foreign subsidiaries or via distributors. 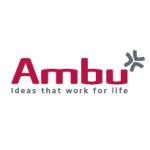 Ambu has approximately 1,700 employees, of whom 200 work in Denmark and 1,500 abroad.